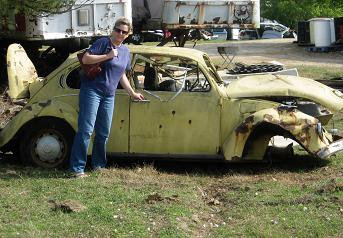 After riding in Debra's 67 Punchbug, I had to go get me one. This one fit my budget. Tom's off backpacking the Art Leob Trail for the next few days, but when he returns, he can fix this baby up for me. Oh my! My husband would love coming home to that project. YOUUUU MIGHT BE A REDNECK IF....oh never mind - the cinder blocks are missing. All you need is a couple cans of paint, and maybe a wheel or two! You can get that thing runnin' yourself, Val! Quite waitin' on a man! Thanks, Denise, I'll check it out. UWanna.... Aint no way I'd get near that thing with my delicate hands. YES, I'm waitin' on a man. Of course. 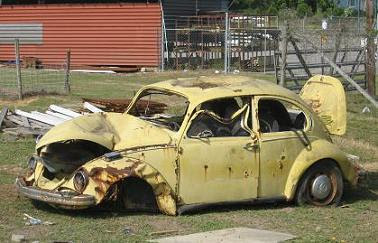 . . you n me together... now... we might could fix her up.